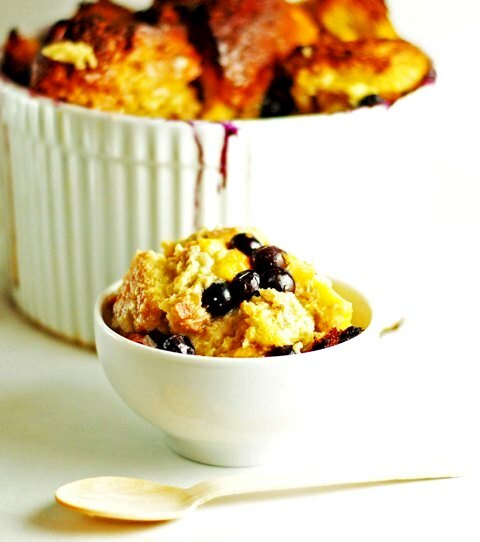 Leftover Challah is turned into this super moist Nectarine and Blueberry Challah Bread Pudding with the addition of ripe summer nectarines and still firm blueberries. An egg custard flavored with cardamon and vanilla makes the flavors of summer even more exotic! Remember that Challah I made? Well, I tucked the leftovers into the freezer with the intention of turning it into bread pudding. Laudalino and I both love bread pudding, it is a nice comfortable dessert for us both. A couple years ago we got hooked on the bread pudding at Tartine Bakery, if you don’t go to Tartine for anything else, go for the bread pudding. Every day they have a different flavor: stone-fruit, banana, currants, etc… In fact, we were going there every Sunday, for breakfast. Yes, breakfast! We would have two coffees, a pastry and a big bowl of bread pudding; we had to stop, 5 pounds later and once we realized we really could not afford these $30 bread pudding breakfasts every Sunday! I knew this extra challah would come in handy. I had some very ripe nectarines as well as some very sweet but not too soft blueberries. I toasted the challah, lightly and layered it with the fruit. Before baking, I covered the mixture with a very fragrant egg custard. I lightly pour some custard in, let the bread soak it in, and then pour more custard. I do this until all of the custard is used and the bread is well soaked. Then I slowly bake it. The end result is a very creamy egg custard bread pudding! Preheat oven to 350. Butter a large baking dish, I like to use a souffle dish for this recipe. Make layers of bread and fruit. Mix together the milk, eggs, sugar, cardamom, and vanilla until well mixed. Pour some of the egg custard over the bread and fruit, let it soak into the bread, then pour more egg custard over. Continue doing this until all the custard is used and has soaked into the bread. Put your dish on a cookie sheet and bake for 50 – 60 minutes, until set. You may have to cover with foil if it gets too dark. One Response to "Nectarine and Blueberry Challah Bread Pudding"
You guys really outdid yourself with this one. I can't wait to make this. Thanks!